I know that there are only two more school runs to get through before our summer holidays begin and I am extraordinarily glad of that fact. It's a busy, tiring, hectic, emotional time on so many levels and we are all in desperate need of a break. I know that in the moments when I've been able to take a little bit of time out of my rush-rush-rush that I've looked up to the sky, breathed in the warm summer air and felt full of gratitude. Even when life feels tough, there is still so very, very much to be thankful for. I know that I feel more than a little miffed when I have to abandon my beloved flip flops and squeeze into my wellies. But the rain keeps our landscape looking lush and green and the clean feeling in the air after a spell of summer rain feels wonderful. I know that as the Little People continue to grow it'll become increasingly hard to persuade them that an after dinner family walk is indeed a Good Thing. The moaning and complaining is so trying at times, and yet when we persevere and make these short outings happen, they are worth their weight in gold. I know that I will always feel a need to be near water. The ripply blues calm my soul and help to ease away the niggling worries of the day. I know that I will always, always be a treasure gatherer when out and about, I just can't help myself. A walk by the river on Sunday yielded these beautiful duck feathers and I was so happy to find them and bring them home. I know that right now I am kind of stressed out by the sheer volume of work mounting up around my ears, but that day by day it should get easier if I keep at it. I'm working on a lot of different things at the moment, including a beautiful floral yarn bombing project which I'm loving. I know that many of you have been asking about the Creative Community project for Yarndale 2015. 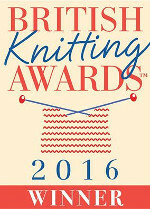 If you are interested in taking part you can read all about it on the Yarndale blog. I know that snipping the first rose of the season is such a beautiful, pleasurable occurrence, one that I really look forward to every year. And this year, just as I do every year, I wish that I had more roses growing! It will be good Lucy to see you back in the Attic doing your crochet, you seem a lot more stressed then you were last year. You inspired me with your joy in every day, please take time to do some crochet soon. I was wondering if you have a contact email you could give me, as I would love to invite you too one of our charity events. I know what it's like to be pressurised and having no time as I've had over the last few months - I'm afraid my housework etc is being given a miss so I can 'help' myself relax a bit with some lovely hooky! Your lovely work must give you joy though, even though there's a lot of it to get through just at the moment. It's certainly inspirational to so many people including me. I assumed, since there were no new blogs from you, that you were again busy with Yarndale...I check and see if there's a new blog from my 'bestie' Lucy...because some of the others are right....your blog is inspirational. It DOES help one relax. It DOES bring back memories for many of us whose children are grown...memories of our own little ones were with us - and we held those little hands in ours - and so relished those moments of love and sharing this beautiful world with them. Oh my! and my grands are so very far away (I live in California, USA - and they all live near the "other Coast"! But I do so relish those precious memories - and so love reading of your "adventures in nature" withe your "Little Peeps"! Thank you, Lucy! You are loved by so many of us! I just wish I lived on that side of the pond for a bit - just so I could meet you in person and give you a big hug of appreciation! Please accept this 'virtual hug' - given with deep feelings of appreciation! I think you need some'me' time. You have a lot to contend with Fortunately you are still able to appreciate things money can't buy ie., nature and your family life and your passion for crochet. Try to find some time to remember who 'Lucy' is, not the blogger, busy mum, wife and the other slots you fill. You give a lot of pleasure to a lot of people, now it's time for some pleasure for you. Take each day as it comes and find some space for just for you. Hi Lucy!!! I have been following you from Florida for a few years, at least 3 Yarndales. I made some Flowers to send to Shirley and it will cost 16.00 Dollars to ship to UK, I may have to seen you a picture of them. I am looking for a less expensive way to send the Flowers over from the USA. You have such a lovely way to write. I adore your blog, atmosphere here is soothing and comforting. Thank you for posting even though you are busy. Hope it eases up soon! I am still at work, too. I will begin my summer holisay on Saturday. Can't wait. lucy.. hi... i´ve just found a pattern in the internet that your going to love( i presume) took the liberty to send to you here... tellme if you liked!! All best wishes - I have enjoyed reading your posts very much! I have followed your blog for years and I absolutely love the peaceful way in which you write. I have also to thank you for providing me with the inspiration to start my own blog as I have found it a really amazing journey. I think most of us who read you, are enriched and lifted by your blog. No pressure Lucy! Thank you for reminding me that life is beautiful and that quiet, soul-refreshing moments must be fought for and cherished. Flowers!!!!!!!!!!! Looks like another eye-popping display and busy postman re Yarndale and for such a brilliant purpose. I have flowers all over the house so will be really happy to contribute once again and hopefully make the journey to Skipton once again in September. erratic with my postings. My life is so much more simpler than yours...I have no live in children to care and worry over only a hubby and one very loving and fast becoming elderly dog that has just been diagnosed with diabetes(sigh). My life is hectic enough with just those few things... so you deserve all the free time you can capture Lucy enjoy it as much as you can. As others have said your posts are like a breath of fresh air Thank you.